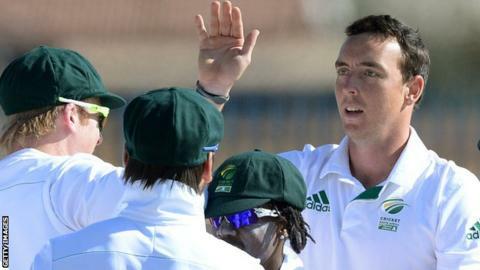 Hampshire seamer Kyle Abbott believes playing in England this summer will be a valuable experience if he is part of South Africa's touring squad in 2017. The 26-year-old, who has played two Test matches, hopes his stint as Hampshire's overseas player will enhance his international prospects. "Experience is the main thing," Abbott told BBC Radio Solent. If I can expose myself to different conditions around the world and play as much cricket to grow in experience I think that is key. "South Africa are coming here in a few years' time so hopefully I can get used to the conditions." Abbott made his Test debut in February 2013 against Pakistan and took 7-29 in their second innings. It was the second best figures taken by a South African debutant but he had to wait over a year for his next Test which came against Australia in March 2014. "It was a tough year on the fringes," he added. "Hopefully I won't have to wait another year." Meanwhile, Abbott says that, at the age of 26, the timing of his move to Hampshire is perfect. "It is something I wanted to do and I am excited to get going now," he said. "The age I am, I am getting to the peak of my bowling. "If I can expose myself to different conditions around the world and play as much cricket to grow in experience I think that is key. It is a different challenge to back home. At home I'm pretty accomplished and experienced and now is time to broaden my horizons. "I've always tried to take myself out of my comfort zone. That is when players perform at their best and away from home that in a professional set up in conditions I am not used to is an awesome opportunity to grow." Abbott hopes to be involved in South Africa's upcoming series against Sri Lanka in July and one-off Test in Zimbabwe in August. If he is, then he will be with Hampshire for around three-and-a-half months, but if not he will stay with the county until the end of August. "If selected I would like to come back as I feel I owe them a lot for accommodating me and signing me," he said. Abbott, who won the South African T20 domestic cup in Winter with the Durban-based Dolphins franchise, also knows Hampshire's new coach Dale Benkenstein. He also hopes to be a part of Hampshire's successful one-day side. "Hopefully I'd also like to get involved with the bowling attack, it's fairly young so I would like to pass on some tips to help them grow," said Abbott. "They are a great one-day side and hopefully I can contribute to that."